London Welsh must wait to learn whether they will be charged with fielding an ineligible player in Premiership games after the decision was deferred. Following a Rugby Football Union hearing on Tuesday, the panel will "consider their decision which will be communicated in due course". The club have confirmed that the player in question is New Zealander Tyson Keats, who plays at scrum-half. London Welsh's former manager, Mike Scott, faces a separate RFU charge. The matter was brought to the RFU's attention by London Welsh after the club conducted an internal investigation earlier this month. "This is obviously a serious matter which the club has not only brought to the attention of the RFU but is also working closely with the RFU to provide full cooperation whilst the case is being prepared and ultimately heard next week," said London Welsh chief executive Tony Copsey. "Due to the sensitive nature and the impending hearing the club is unable to make any further comment at this time." Keats, 31, joined the club in 2012 having previously played for Aironi. In 2007, Leicester Tigers were docked one point for fielding a player who had been temporarily registered with another club. Sale Sharks were also docked one league point and fined £5,000 for fielding an unregistered player in their Premiership match against Harlequins in 2009. The last Premiership club to be docked points were Exeter, who received a two-point deduction and £5,000 fine in April 2011 for fielding too many overseas players in a league game against Leeds Carnegie. London Welsh, Premiership newcomers this season, are currently three points above bottom club Sale Sharks with five league games left. They face Gloucester and Bath, both away from home, before hosting Northampton, visiting fellow strugglers London Irish and then welcoming Worcester to the Kassam Stadium on 4 May, when the Premiership's regular season ends. 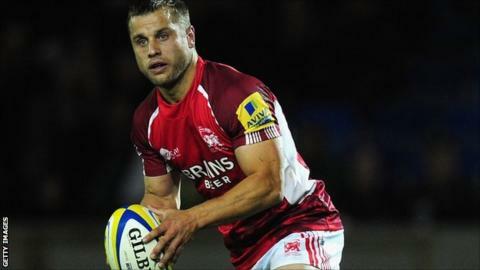 Welsh's arrival in the Premiership was not confirmed until last summer, and only then after winning their appeal against an RFU ruling that they had not met sufficient criteria to gain Premiership entry, namely primacy of tenure at Oxford's Kassam Stadium, where they have played their home games this term. The appeal panel agreed with the club's argument that the applied criteria contravened EU and UK competition laws, and Newcastle were relegated after finishing bottom of the Premiership last season.